[154 Pages Report] The micro-LED market is estimated to grow from USD 0.60 Billion in 2019 to USD 20.50 Billion by 2025, at a CAGR of 80.1% between 2019 and 2025. The base year considered for the study is 2018; however, as of 2018, only the digital signage application is commercialized following Sony’s launch of micro-LED-based “CLEDIS” displays with 1.26mm pixel pitch and ~50-micron size RGB pixels. Major applications such as smartwatches, NTE devices, and smartphones are expected to be commercialized 2019 onward, owing to which the forecast period for the report is considered to be 2019–2025. The research methodology includes the use of primary and secondary data. Both top-down and bottom-up approaches have been used to estimate and validate the size of the market, as well as other dependent submarkets. Key players in the market have been identified through secondary research. Secondary sources include references such as annual reports, company press releases, Factiva, and investor presentations of companies; white papers, consumer electronics exhibitions, and certified publications (such as IEEE, Science Direct, and articles of recognized authors); websites (such as Consumer Technology Association (CTA), CS International Conference, SEMI, International Signs & LED Exhibition, Display Taiwan, OLED-Info, Integrated Systems Europe, qled-info, FlexTech Alliance, and Touch Taiwan); directories; and databases. All the percentage shares and breakdowns have been determined using secondary sources and verified through primary sources. All possible parameters that affect the markets covered in this research study have been accounted for, viewed in extensive detail, verified through primary research, and analyzed to obtain the final quantitative and qualitative data. Major companies operating in this market are Apple (LuxVue) (US), Oculus VR (InfiniLED) (US), Sony (Japan), Samsung (South Korea), X-Celeprint (Ireland), Epistar (Taiwan), GLO AB (Sweden), VerLASE Technologies (US), JBD (China), and Aledia (France), among others. Some of the key innovators in the micro-LED market include Mikro Mesa Technology (Taiwan), VueReal (Canada), Uniqarta (US), ALLOS Semiconductors (Germany), Plessey Semiconductors (UK), PlayNitride (Taiwan), and Ostendo Technologies (US). Some other prominent players in the micro-LED market include Lumens (South Korea), Lumiode (US), Rohinni (US), Cooledge Lighting (Canada), and Nichia (Japan). Some of the prominent research institutes undertaking research in the micro-LED market are Industrial Technology Research Institute (ITRI) (Taiwan), Changchun Institute (China), III-V Lab (France), CEA Leti (France), Hong Kong University of Science and Technology (Hong Kong), and Fraunhofer-Gesellschaft (Germany). Some of the input suppliers developing related materials and components in micro-LED market include Jasper Display (Taiwan), Crystalwise Technology (Taiwan), Unimicron (Taiwan), Luminit (US), Macroblock (Taiwan), and Max Technologies (Taiwan). Company Profiles: Detailed analysis of the major companies in the market. Micro-LED is an emerging display and lighting technology with the potential to disrupt the traditional LCD display and LED lighting markets. Micro-LED technology is being developed to offer high brightness at low power. The micro-LED market is estimated to grow from USD 0.60 Billion in 2019 to USD 20.50 Billion by 2025, at a CAGR of 80.1% between 2019 and 2025. Increasing demand for brighter and more power-efficient display panels for smartwatches, mobile devices, and NTE (AR/VR) devices is a major factor for the growth of the market. The rising interest of electronic giants Apple, Samsung, and Sony and interest shown by input/component suppliers in the supply chain also contribute to the market growth. The micro-LED market can be broadly divided into display and lighting segments. 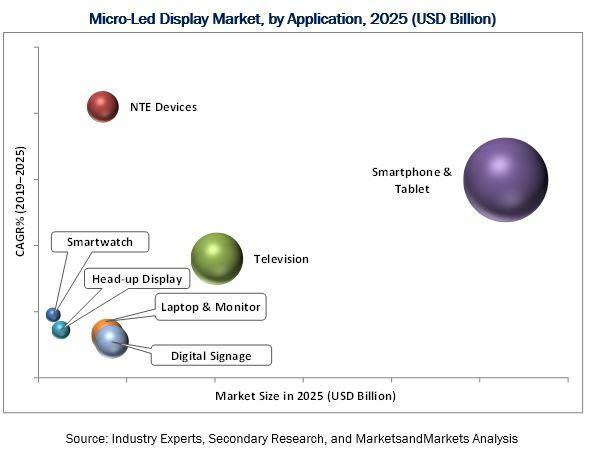 The micro-LED display market is segmented on the basis of applications into smartwatches; near-to-eye (NTE) devices (AR & VR HMDs); televisions; smartphones and tablets; head-up displays (HUDs); laptops and monitors; and digital signage. The market is further segmented on the basis of display panel size into microdisplays; small- and medium-sized panels; and large panels. On the basis of verticals, the market is categorized into consumer electronics; advertisement; automotive; aerospace & defense; and others. The micro-LED lighting market is segmented on the basis of applications into general lighting and automotive lighting. As of 2018, only the digital signage application is commercialized following Sony’s launch of micro-LED-based “CLEDIS” displays with 1.26mm pixel pitch and ~50-micron size RGB pixels. Considering the current manufacturing capabilities, prototype development, and the involvement of leading players, micro-LED-based smartwatches and NTE devices may enter the commercial phase in 2019. The micro-LED market for NTE devices is expected to grow at the highest CAGR between 2019 and 2025. Demand for micro-LED-based smartphone display panels is expected to grow rapidly; however, limitations in mass production may restrict the actual supply volumes. With the launch of new foundries or manufacturing plants, high demand can be fulfilled over time, and the shipment volume will increase rapidly between 2023 and 2025. Smartphones and tablets are high-volume applications, and once commercialized, the corresponding market share will rise to dominate the overall micro-LED display market. Small- and medium-sized display panels are expected to dominate the micro-LED display market by 2025 in terms of share, while the market for microdisplays is expected to witness the highest growth during the forecast period. APAC is expected to dominate the micro-LED display market during the forecast period with the presence of leading brand product manufacturers, LED foundries, and display panel manufacturers in the region. Samsung, LG, Sony, Sharp, Panasonic, and several others will account for major demand for micro-LED display panels by 2025. Significant research by input suppliers required for the establishment of a strong supply chain will drive the growth of the micro-LED display market. At present, the lack of an established supply chain and distributed patent portfolio are the major restraints for the growth of the market. The fast adoption of OLED technology in display devices may further hinder the commercialization and growth of micro-LED technology. Trade-off between pixel volume and pixel size; huge investment requirement in infrastructure, equipment, and process development; and need for different manufacturing processes as well as equipment compatibility are the key challenges faced by micro-LED technology developers. Low yield, high cost, and need for improving micro-LED production and mass transfer processes are also the major challenges for the commercialization of the technology in different products. The manufacturing of micro-LEDs on large silicon wafers and growing demand of wearable displays for smartwatches and AR/VR HMDs are the major opportunities for micro-LED developers. Players will require increased investments to tackle these challenges and facilitate growth in the coming years. 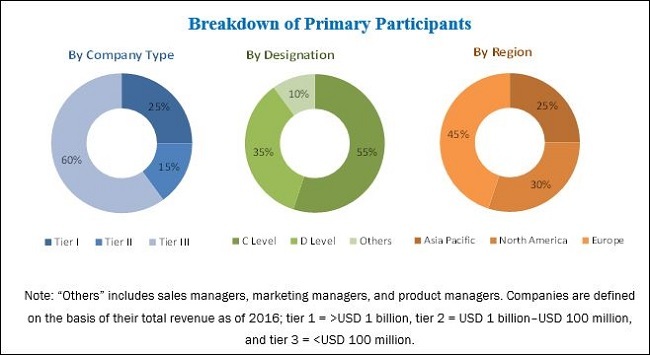 This report comprises drivers, restraints, opportunities, and challenges pertaining to the micro-LED market; and extensive value chain analysis, patent analysis, analysis of the current manufacturing capability and technology status, commercialization potential in different devices, along with market size forecasts till 2025.